We get lots of questions regarding the various uses for the serial RS-485 ZM-9011, ZM-9012, ZM-9013 and ZM-9014 remotes. One popular one is about volume control. Now the ZM-9012 (rotary volume only) and the ZM-9014 have a dedicated rotary volume control and it can be assigned to be an input channel volume control, an output channel volume control, a grouped input channel volume control or a grouped output channel volume control. But did you know that you can make the buttons on so equipped serial remotes into volume controls similar to the functionality of a ZM-9001 or ZM-9002 wired remote control? The only requirement is that you have available pairs of contact inputs and outputs available for this application. So for this example let’s use an A-9060SM2 where we are going to have two inputs with button volume controls and a master output volume control using a ZM-9014 serial remote control. Of course to complete the basic equipment list you will need an input module such as the D-001T, an RC-001T serial remote control module, and its power supply the AD-246. For connections we will not go over the basic input and output connections, and the basic RC-001T connections which you should know by now. Of course if you need a reminder, examples are available in the instruction manual. However, let’s look at the connections required for this application as they apply to the 14 pin control connector. We are going to marry two sub-systems together, the RS-485 serial remotes along with our contact closure circuits. To start to make this application work, we need to connect 4 input contact closures to 4 output contact closures. The reason for this is we can control the output contact closures with the serial remotes and operate them via the buttons on the remote, and we can set the input contact closures for volume control use. Can you see where we’re going with this? In the picture below you will see the physical connections necessary to make this work. It’s simple, connect input 1 to output 1 and so on. A ground or “E” connection is not necessary as we are not connecting off the mixer itself, so internal ground will take care of it. Now you have all the connections necessary to make this work, so let’s take a look at the programming screens to finish the control. On the next page you will see the options available for the C-IN control. In our example we choose volume up and down twice as shown under Parameter and the input sources are married to a pair of volume up and down contacts using the Channel/Scene dropdowns. You then can choose the resolution of the button presses between 0.5dB ~ 10dB in their respective dropdowns. We have chosen 1dB in this example. Once this is all done click OK and the screen will save and close. Now we will move on to the serial remote settings. ZM-9001 & ZM-9002 which we are not using. Select None for both Remote Volume 1 & 2 and click Next. Then we will get the serial remote start page. On the initial serial remote setup page above, select 1 remote, Simultaneous Mode, and the ZM-9014 remote options. The ZM-9014 comes set from the factory at address 0 so you won’t need to change this typically. However, please check that the software setting for address matches the remote’s setting. Normally you will start at address 0. Now the reason why we chose Simultaneous Mode for this exercise is let’s say this is for a conference area. The mic may need to be on at the same time as the BGM music or audio source. This setting will allow that. If set to Exclusive mode, you will only be able to choose one input at a time and pressing the volume keys may in some cases affect your input source. Okay, now click Next. Now you see the programming screen of the ZM-9014 above. From the Function Select dropdown menus you will select Change C-OUT for all 4 buttons. Under Assigned Value you have 2 options, Level and Toggle. This is somewhat confusing. I would rather have the terms Pulse for Level and Latch for Toggle. So for our application we want to choose Level “Pulse” for all four dropdowns. To the right of this option you have dropdowns which are unlabeled. These dropdowns are the contact control output settings. Set the options as shown 1 ~ 4 as we have used buttons 1 ~ 4 in order and that’s how we wired the contact inputs and outputs earlier in our discussion. Lastly for the rotary volume control, select Output Volume and the Assigned output channel 01. Then click Finish. Now you’re all set. Your ZM-9014 will work completely like a volume control. The upper two buttons will be the volume control for the Mic and the bottom two buttons will be the volume control for the BGM or audio input. The rotary volume control will be the master output volume control. TIP: Now if you want to have more than one of these remotes in the room, no problem. You can add more ZM-9014 volume controls around the room, just program them similarly as the first remote. You will just have different address settings for each on the initial serial remote settings page. The neat thing is that each volume control knows what the other one is doing so the volume display on each volume control will be the same around the room. No wondering what one volume control is doing versus another one. If you want to meet a celebrity without all of the paparazzi hype, visit Madame Tussauds. With locations in Europe, Asia, Australia, and the United States, Madame Tussauds aims to create distinctive, unforgettable and gratifying guest encounters, realized through the passion of wax. But what would the experience be without great quality sound? Enter David Prentice of Dale Pro Audio in New York who worked hand-in-hand with Kevin Wilkin of TOA Electronics, Inc. to expedite delivery of products which were ordered, literally, at the last minute. This project was unusual for a number of reasons. Daryl Bornstein of Daryl Bornstein Audio, and his longtime colleague, Roger Jay of Play Sound, were charged with designing and installing a playback system in a pre-existing and relatively small (40' diameter), round, domed room. A truss system, meant to emulate the last U2 tour giant crab stage was installed, from which the speakers would be mounted. The client requested speakers that would look like a concert sound system, but the scale of the room and the limited budget precluded most of the obvious choices. Initially, they did not consider the TOA HX-5 Variable Dispersion Speaker, which was perhaps the most obvious choice for this type of project considering the look, weight, and cost of the speakers, but because they did not think they would deliver the sound quality or sound pressure level required. They looked at solutions using speakers mounted on the perimeter of the room/truss system, pointing towards the center of the room. This would have been a perfectly acceptable "generic" choice, using small column speakers like the TOA SR-Series Slim Line Array, with additional sub woofers, however they would not address the client's request for the speakers to be an integral scenic element. More importantly, mounting column speakers on the truss supports would obscure some of the lighting effects in the vertical truss along the wall. It also would have placed the speakers too close to the patrons due to limited height of the truss and the relatively small size of the room, even though the SR-S’s work well fairly close. In short, the column speakers would be intrusive rather than adding to the theatricality of the exhibit. But they did not give up on this solution until fairly late in the design process. Ultimately, at Roger's urging, they revisited the TOA HX-5 Variable Dispersion Speaker. The client had designed prop line arrays to hang from the center truss. They convinced the client to allow them to substitute the HX-5’s for the props. The HX-5’s fit the scale of the room better than the props, saved the client money because they no longer needed to build the props, and mounting the speakers in the center or the room, facing out towards the curved wall, providing better overall coverage without over exciting the room. Also, the HX-5s came in black, their desired color, unlike the SR-S’s which come in white only. They were thrilled not to have to paint the main speaker system components. 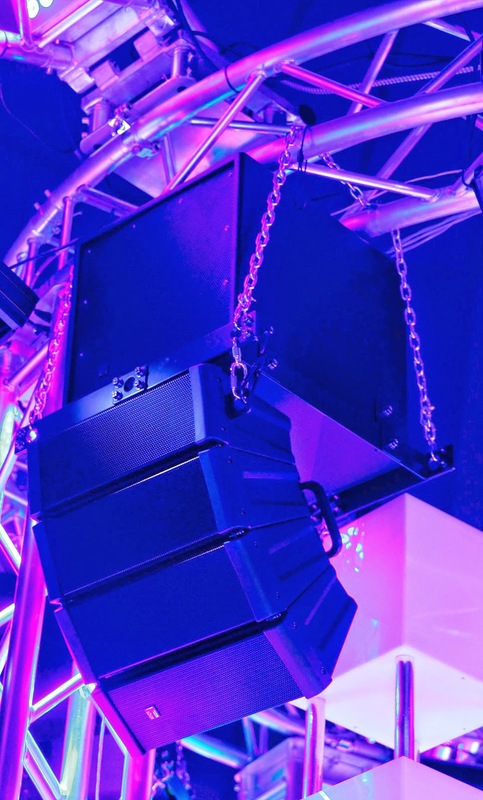 The tight and adjustable vertical pattern of the HX-5 Line Array Speaker, most often used to throw longer distances, was quite effective in keeping sound focused on the guests and off of the walls, even though they were throwing only twenty feet. The wide horizontal pattern allowed for seamless coverage throughout the room. They would not have achieved the same coverage if the speakers had been mounted on the walls facing into the room or if they used conventional, horn loaded (typical trapezoidal) PA speakers. 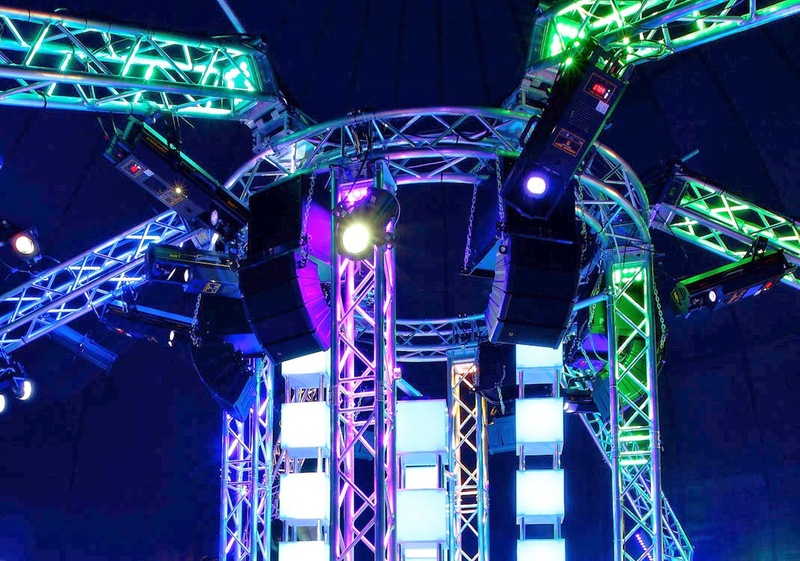 Additionally, having the speakers mounted in the center facilitated having the guests walk into the room and walk directly into the sound from the speakers, creating the effect of walking into a concert in an arena. This is the effect the client had hoped to achieve. They convinced the client to use more speakers than they had originally considered so that they could achieve better coverage and provide a stereo image throughout the room by feeding alternate speakers with left or right signal content. This was possible because the TOA solution was extremely cost-effective. They used six arrays consisting of one (1) HX-5 Variable Dispersion Speaker and one (1) FB-120 subwoofer flown. They insisted on six (6) subs, rather than two (per the client’s request), because they wanted to have even low end throughout the room. The look and integrated sound of this type of array speaker and sub combination was perfect for this application, and alleviated concerns that they would not get enough extended low end out of just two 12" flown subwoofers flown separately. Using lightweight subs that fly as an integrated part of the system solved a number of problems. System processing was achieved with a Symetrix Solous 8 and the speakers were powered by three Electrovoice CPS2 series amplifiers. Because of the structure of the center truss supports, the ideal solution would have been eight (8) arrays, rather than six (6), but that was not within their budget, nor would the client agree to that many speakers, when they already thought six were excessive. In the end, the client was thrilled with the look and the sound. The TOA rigging frames made the job very easy. Combined with the light weight of the array speakers, the installation was far easier than expected. Their biggest challenge, because of how they chose to fly the speakers on the truss, was securing the chain so that it would not move. Ultimately, Jay came up with the solution of using simple hose clamps which worked brilliantly.Bornstein was concerned that the speakers would not sound as good as they needed, or sound like the type of “dance club sound system” that the client had requested for the Music Room, which houses figures of current pop stars. After entering crossover and EQ data provide by TOA, and then spending time squeezing every ounce of performance quality out of the arrays through additional EQ, dynamics, and balancing hi/mids to lows, they achieved far better results than they could have hoped for. In fact, they were, and remain; astonished that the speakers sound as good as they do, especially in light of Bornstein’s initial listening when the product was first introduced. For a speaker designed to reproduce spoken word in churches, it does a very fine job reproducing loud pop music. They were charged with providing a robust system that met stringent visual criteria, was within a very tight budget, could be installed within an ambitious (tight) schedule, sounded great both at low and extremely loud volumes, and would function year in and out without failure or maintenance. The HX-5 and FB-120 combination addressed the client's needs perfectly. Bornstein was also asked to provide a playback system for a stadium crowd sound effect loop in the foyer leading into the Music Room. This space was extremely challenging because it was an odd shape, with a very low ceiling, scenic elements on the walls, and had a very small budget. Again, by choosing a TOA product, the small H-1 Interior Design Speaker, they were able to deliver high quality, focused sound, yet, without an obvious point source, which could be mounted in the ceiling, addressing both the client's aesthetic and budgetary requirements. After painting the speakers black, they "disappeared" into the ceiling, adding to the overall immerse effect of walking through a pedestrian tunnel into a concert arena. This is saying a lot since the ceiling is only seven feet high! This was a truly inspired solution which Jay came up with. The playback and power for the speakers was provided by a Gilderfluke SD-25 combination digital playback system/amplifier. Once again, the client wanted only two (2) speakers but we felt four (4) were necessary to achieve an immense stereo crowd effect. And this was, indeed, the case. We were able to deliver the four (4) TOA H-1's for less than two of another product we had considered initially. The H-1s were a far better solution. TOA was chosen over other products because of price, look, ease of installation, and appropriateness of the products. Everything was delivered in time, and the installation was easy due to TOA's clever and efficient rigging and mounting hardware. Bornstein and Jay exceeded the client's expectations with TOA’s solutions.